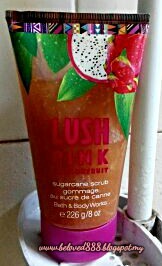 Lush Pink Drangonfruit Sugarcane Scrub is signature collection from Bath & Body Works. The fancy packaging attract my attention to try on it. Sweet and seductive, this fragrance combination of dragon fruit and wild jungle plum is perfect for everyday use. The main ingredient is Sugarcane and Sugarcane crystals naturally exfoliate while Acai Berry Extract and Maracuja Oil Protect and nourish skin. Lush Pink content luxurious formula and it creates a rich, indulgent lather to soothe and smooth my skin. Complete scent includes top notes of pink dragon fruit, passion fruit nectar, pomegranate, Caipirinha, sparkling mandarin, and lush pineapple. Mid notes include red hibiscus, Amazonian water lily, and beach gardenia. Dry notes include jungle plum, coconut, and sandalwood. I love the texture of this scrub. This sugar scrub is a little bit different than my other ones that I have. This sugar has a fine granule and I love the feeling. It actually helps to scrub off the dead skin and prevent blockage in my skin. You can see the different in picture A and picture B . 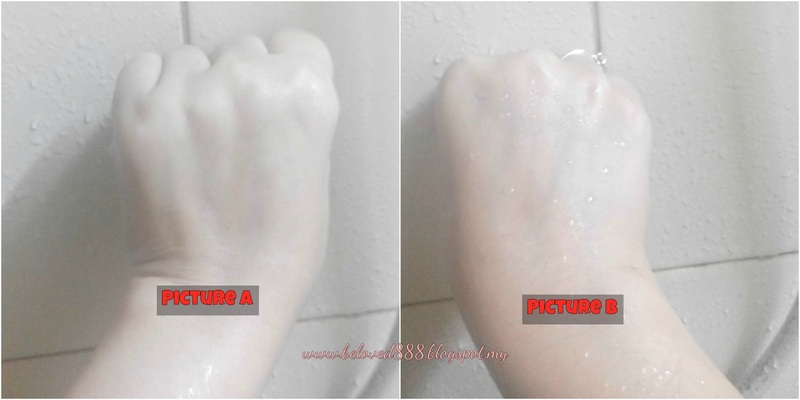 In Picture A, you can see my hand is clean while picture B, the water drop appear on my hand due to blockage. Follow Bath & Body Works in Facebook for more information regarding Lush Pink Dragonfruit Sugarcane Scrub.